Please refer to our stock # TC10082 when inquiring. This is a wonderful vintage unsigned August Bonaz penguin pin. 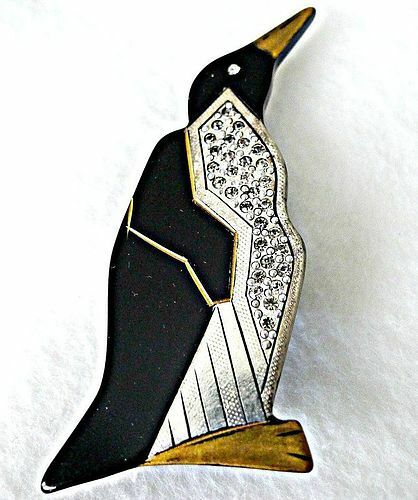 The original art deco pin is black galalith (French Bakelite) with gold and silver paint and inset crystal rhinestones on the penguin's tummy. He is 2-3/4" tall and has a French trombone style pin back. This was purchased in Paris after the discovery of a collection of old Bonaz stock, never used, was discovered. There are a few signs of age but no noticeable damage. This identical penguin (only in green) is pictured on page 29 "Delightful Brooches by Bonaz" in book "European Jewelry" by Ginger Moro, Schiffer Pub, 1995.